Make the connections as shown below. Route the Line wire thru the 1/L1 - 2/T1 aperture and the Neutral thru the 3/L2 - 4/T2 aperture. Any wires routed thru the 5/L3 - 6/T3 aperture are ignored when the MM is configured for single phase operation. If the MM is capable of voltage sense, connect Line to V1 and Neutral to V2. 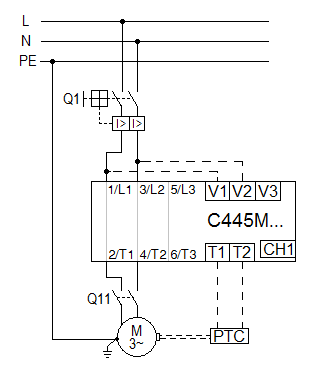 Inputs to V3 are ignored when the MM is configured for single phase operation. That’s it! The C445 also supports ground fault for these single phase 120 vac applications because it can take the difference between the 2 wires passing through the CTs. NOTE: The figure above depicts both Line and Neutral switching and protection. Only the Line current may be switched if local code permits.